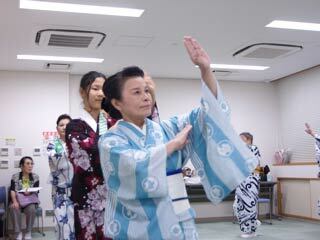 Tokyo Ondo (東京音頭) is one of the most popular Bon Odori song in Tokyo. It is very easy dance, so it plays many other place as well. Song: Kouta Katsutaro Mishima Hitokoe. Face your stomach to the walking direction, and count four. Shade with your right hand and step back. Shade with your left hand and step back. Make a circle with your arms. Step with right foot. Then, circle with left foot step. Stretch your right arm and touch right elbow with left hand. Step right foot. Dance team: Minato Waodorinokai, Ran no Kai.